12 July 2017. Tests of a lab-on-a-chip system show the device can rapidly isolate and recover cellular carriers of biomarkers useful in detecting cancer and other diseases. Tests of the device, made by the company Biological Dynamics in San Diego, are described in the 3 July issue of the journal ACS Nano (paid subscription required). Labs-on-a chip are usually made of clear plastic or glass strips with fine channels where small specimen samples, often no more than a drop, can be quickly analyzed. The channels are treated with cells or reagents that react to the specimens, then measured and reported by attached instruments. Because these devices are often inexpensive and portable, they are often the basis of medical diagnostics performed at the point of care, such as local clinics or field hospitals, rather than sending samples off to a remote lab for analysis. Biological Dynamics develops labs-on-a-chip with its AC Electrokinetics or ACE platform that sends an electric current through the chip, helping isolate biological targets of interest. The targets in this case are exosomes, tiny — 40 to 150 nanometer — lipid-membrane containers in cells that gather up and secrete cytoplasm, the gel-like material outside the cell nucleus. While originally believed to carry out waste removal and other maintenance tasks, exosomes were shown in recent years to perform useful delivery functions carrying proteins and genetic material to other cells, and drawing increased attention from a range of biological disciplines. In the paper, a team from University of California in San Diego led by bioengineering professor Michael Heller tested the ability of an ACE chip from the company’s ExoVerita line to isolate and identify exosomes in blood plasma samples with biomarkers — protein indicators of disease — for 2 types of cancer. The samples were human blood plasma with added exosomes containing glioblastoma, a form of brain cancer, and a plasma sample from a breast cancer patient. The results show the ExoVerita chip analyzed minute plasma samples of 30 to 50 microliters and returned results in about 30 minutes. The chips isolated the exosomes that accumulated on the chip’s electrodes and illuminated with fluorescence. 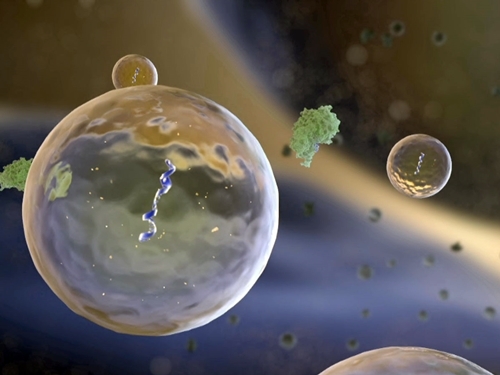 A simple wash of the chip removed other plasma components leaving the exosomes intact, containing RNA that could be analyzed further. “Current exosome isolation methods are generally expensive, complex, and cumbersome, which could limit large-scale diagnostic applications,” says Heller in a company statement. “This study describes a relatively simple, rapid, and non-destructive method for the isolation of exosomes, that preserves their valuable biomarker information for direct analysis.” Heller is a scientific advisor to Biological Dynamics. The company says the use of chips for exosome analysis make liquid biopsy tests more feasible, and thus make cancer screening available to larger populations. The technology can also be extended to diagnostics for traumatic brain injury and infectious diseases.